Leverage the model in a live environment. Integrate seamlessly with transactional real-time business processes. Develop intelligent business processes with the business processes UI designer. After we get our models running, during their whole lifecycle, they generate many artifacts: tables, images, data structures, etc. IRIS Analytics can help with visualizing and exploring these artifacts. 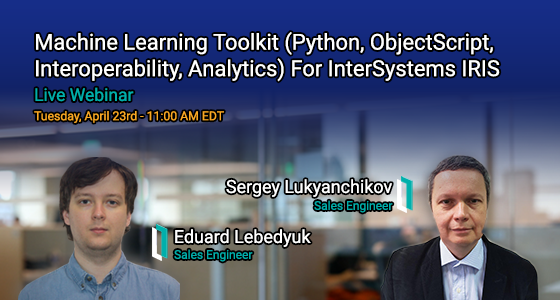 ML Toolkit use cases will also be presented to show how you can best utilize them in your solution. Note: The language of the webinar is English.